During the "Rally to Restore Sanity" event last October. Via Bob: An apparent view from inside the train involved in the fallen pole incident near the New York Ave. station this afternoon. As of 5:18 p.m., it was still causing major delays. Update: The light pole in the bus depot parking lot fell and was hanging across tracks. I was in the very front when the accident occurred. The operator stopped the train quickly but was seriously distressed after. I called 911 and stayed with the operator to give assurance. Metro and emergency vehicles were on the scene quickly. We went to NY Ave station and disembarked. That's pretty much it. 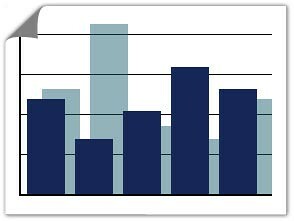 The rise in crime on Metro came as no surprise to Unsuck readers. The trend was apparent back in January. Thing is, the trend was also apparent a year ago, when robberies were up 54 percent and Metro made the above video and issued this press release about how they were going to combat theft. Doesn't seem like those efforts, if they really even happened, helped at all. I thought I’d share my wife’s experience yesterday morning. She was on a Red Line train at about 9.30 a.m., when a youth gang perpetrated a brazen and well-planned attack on the Metro car while sitting at Takoma station. To begin with, a simulated fight broke out as a distraction. Then, right before the doors closed, other gang members physically wrestled smart phones (Droids, iPhones) from people’s hands and fled. One gentleman was thrown to the floor as he was robbed. 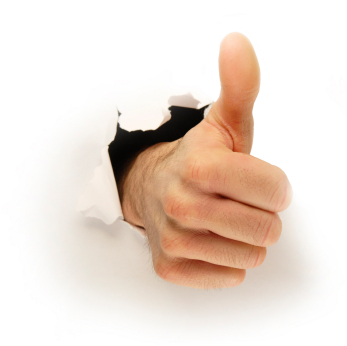 My wife’s arms were grabbed by an assailant as he wrestled her iPhone from both her hands. My wife thought at least four people were robbed. My wife took advantage of the car doors not closing first time and, along with a male victim, chased the after perpetrators along the platform, raising a hue and cry. The station operator saw all this on the cameras and alerted the police, who responded fairly quickly. But the gang jumped the barriers and escaped. From "intrepid singing attorney Matt Schwartz (www.LexAppeal.org)"
Trouble on the 3Y line the other night as a big gust of wind blew the top off bus 2550. The top panel is meant to be removable - there's stuff under there, the driver tells me - but apparently it was not secured well. 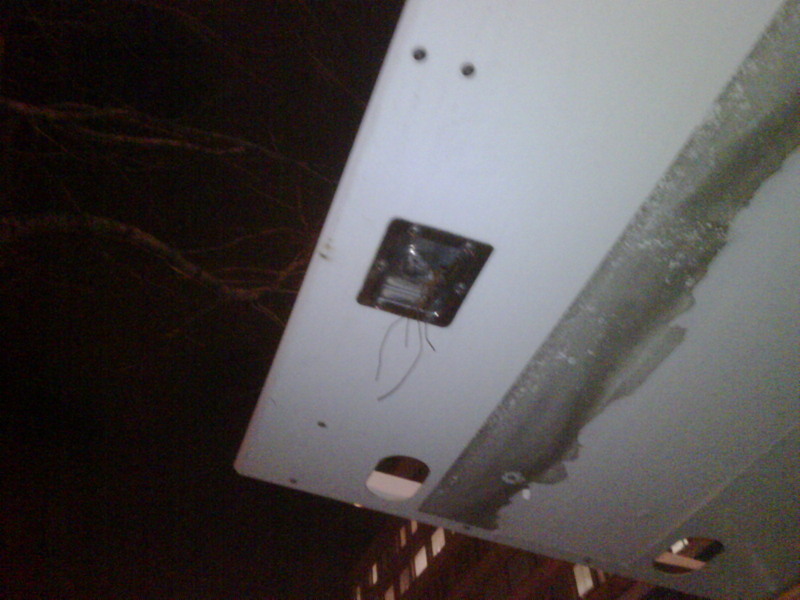 Looks like thin copper wiring was being used to secure the flap. It was no match for the wind. The other side was held down the same way. The driver told another driver (of the 16Y) what happened, and that driver said the exact same thing happened on her bus last week! I'm not sure if the wires were there as an additional safety precaution or if they were a jury-rigged replacement for broken latches, but if the roof blew off on the highway, there could have been major trouble. 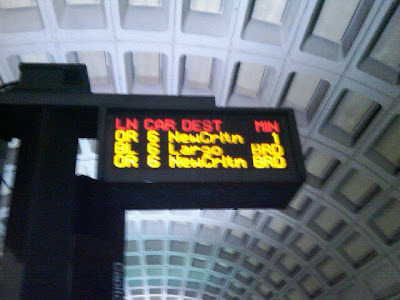 Perhaps Metro could have taken advantage of the down time. We asked, and Metro didn't bother to answer. The Smithsonian Metro stop has just been closed for three days over the long weekend. The middle escalator going out of the station has been down for two weeks. The escalators to the platform coming up out of Vienna/Franconia side have also been out for over a week while they have been running the other escalator to the platform going DOWN! Anyway, yesterday morning, at the peak of rush hour, two of the three escalators leaving the station were shut down forcing people to walk up AND down the same one, which created a single file line all the way from the fare gates. The open "escalator" was caked in ice from the winter weather, amazing no one fell. 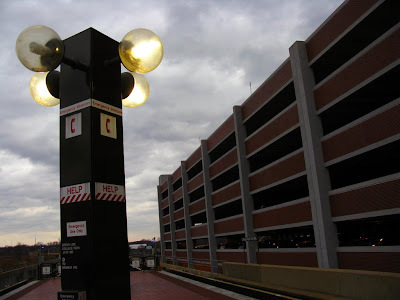 Over 5,000 people work at the building that sits directly atop the Metro stop, with thousands more that walk to adjacent buildings and tourist attractions. Apparently, in three days of maintenance, the escalators weren't a priority to be fixed. 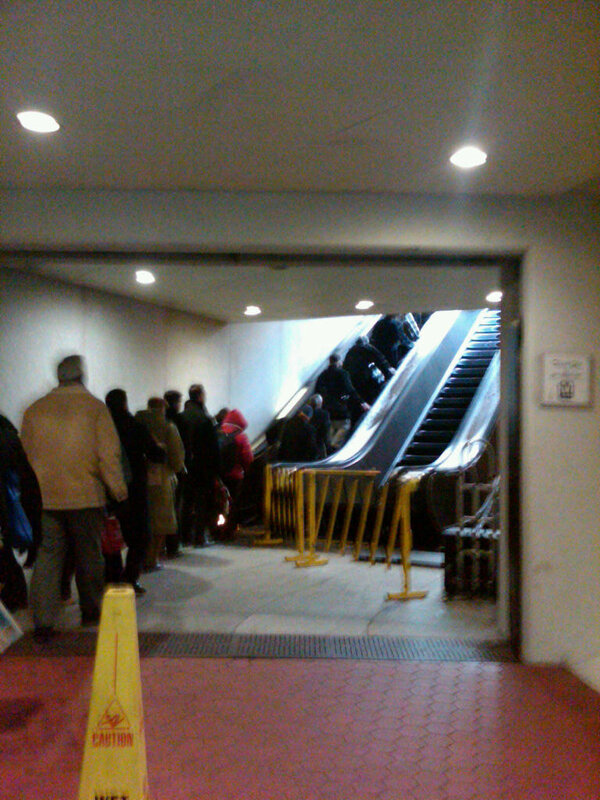 Friday's incident at Foggy Bottom again shows something is deeply flawed, not only with the escalators themselves, but how WMATA "maintains" them. 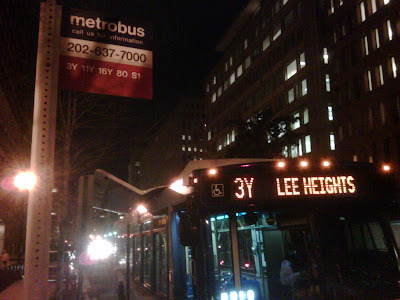 Age is certainly a factor, but near tragedies like L'Enfant and Foggy Bottom should never happen. Over the past months, Unsuck has tried to get at some of the other root causes Metro could be remedying now, at little cost. What jumps out in Metro's most recent report on escalators is the focus on availability instead of reliability. Under an availability über alles scheme, an escalator expert said workers are probably doing whatever they need to get the thing working again--quickly. 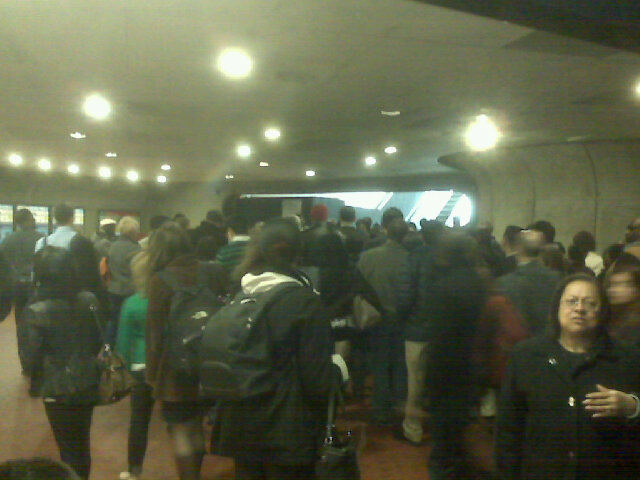 "They're not getting to the root issues," said a source familiar with Metro's escalator program. "Instead of making good repairs, they're just resetting things" so the escalator is back up and running again but breaks down shortly thereafter. Why is there this mentality at Metro? Perhaps it's because the escalator teams are not capable of making the kinds of complex repairs needed and are only able to provide Band Aid fixes. From 1976 to 1991, Metro’s escalators were maintained by Westinghouse, the manufacturers of most of the escalators, and later Schindler, which purchased Westinghouse. 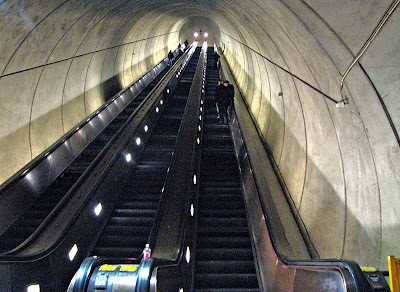 In 1991, as a cost-cutting move, Metro decided to "maintain" the escalators themselves. The new workforce would be members of ATU 689. 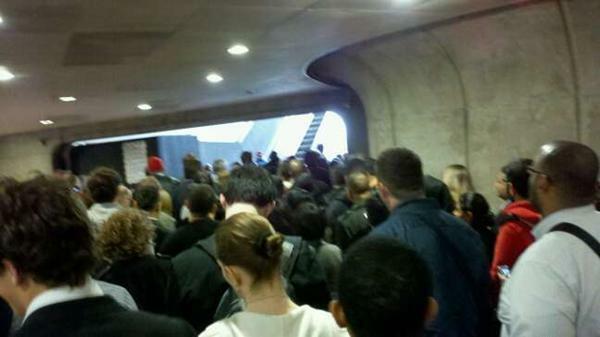 Our source said Metro was faced with the extremely daunting task of creating an escalator repair force "out of thin air." Making it even more challenging was that Metro--because they were trying to save money--was paying less than market for its workers, so attracting and keeping the best workers was made all the more difficult. So hurried was Metro's attempt to create a viable escalator/elevator workforce, it even went so far as to basically steal the training program from the National Elevator Industry Educational Program (NEIEP) for some time before they were sued to cease and desist, according to the source. NEIEP training is funded by contributions of employers, something Metro doesn't pay into. 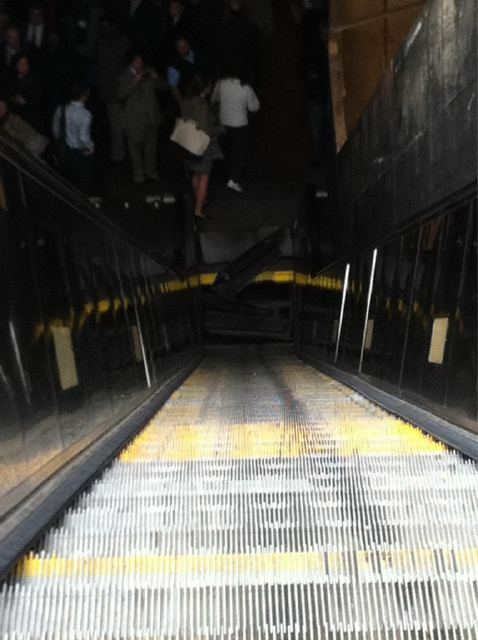 Within a few years, escalators started to deteriorate, the source said. Some of them ended up in such a bad state that Metro’s own workers were not able to fix them, forcing Metro to contract out the work to the people who’d been fixing and maintaining the escalators before 1991. So much for saving money. Metro was essentially paying its own full-time staff and then paying more to bring in people to fix the worst escalators. This was an untenable situation, and things reached a head in 2002, when Metro commissioned a blue ribbon panel to try to turn things around. How much they paid for the panel is unknown, but what is certain is that Metro didn't follow the recommendations. Metro took the half step of turning over some of the older, more troublesome elevators to the people who’d done it before 1991, keeping the rest for its own workers. 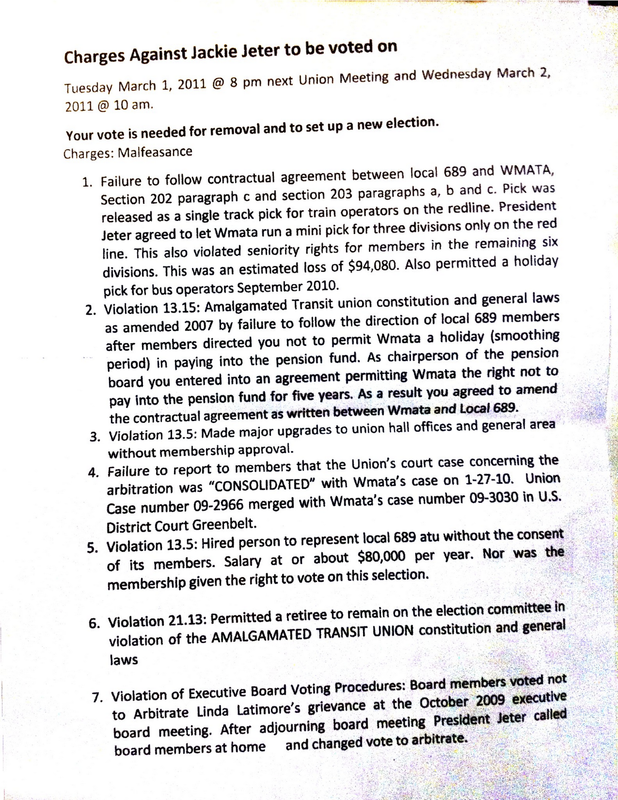 That arrangement lasted until July of 2010, when the responsibility of all escalator maintenance returned to ATU 689. 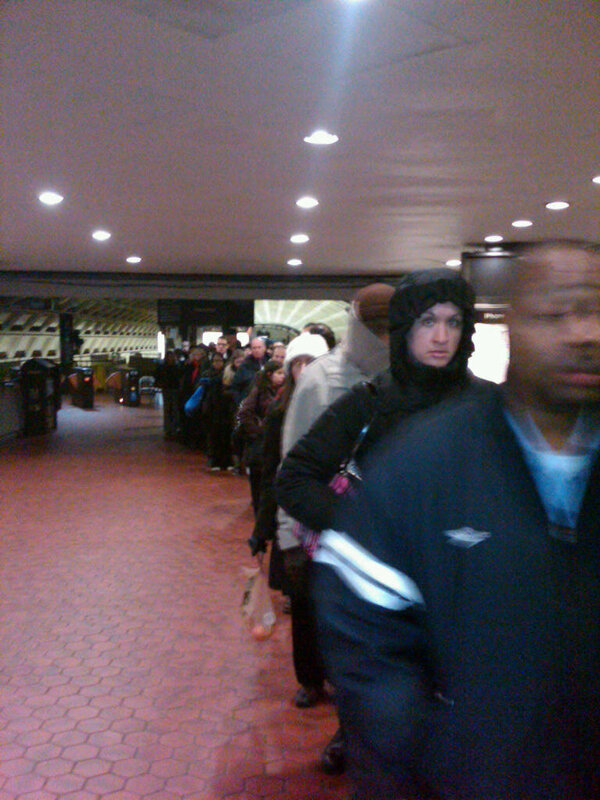 This was despite the report clearly stating Metro's escalator workforce was not as experienced as industry averages. In 2002, the report said, "top [escalator/elevator] mechanics in the area are typically in the trade from 12 to 15 years, sometimes more; WMATA average is 3.5 years." 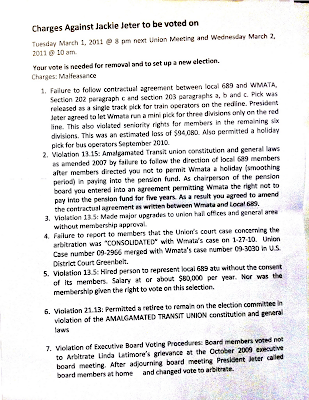 Furthermore, the source said, ATU 689 doesn't provide the constant training outside escalator workers get. Metro's workers are certified under a program called Certified Elevator Technician, and while our source called the NEIEP "far superior," and the "only program recognized in all 50 states," there does seem to be some debate among elevator escalator workers about the merits of each. However, it is true that the CET program is under scrutiny because exams aren't proctored and many exam questions are given out before the exams, the source said. They added that the CET further lags behind NEIEP because it's largely computer based and has little classroom instruction. On Feb 9, I got to start my morning commute waiting for the tiny elevator down to the Wheaton platform along with about 75 fellow Metro riders. Because there was only one escalator in service, and it was operating in the up direction. People were getting tired of waiting for what must be one of the slowest moving elevators in history, and braving the escalator in the wrong direction. Yes, that's right. They were walking down the approximately 170 steps while the escalator was operating in the opposite direction. No assistance or guidance from any Metro employee. Thanks again Metro for a great commute! Metro named Richard Sarles its a new, permanent leader last month. He's got a long background in transit management and is paid handsomely for his experience and expertise. One would think his opinion would be sought out and trusted. After all, he's ostensibly not only the general manager, but also the CEO. Well, now is the time to be a leader, Mr. Sarles. 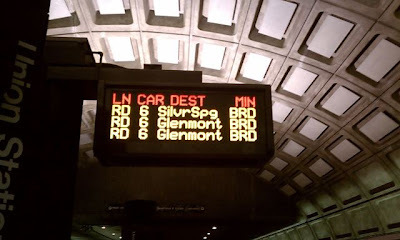 A hot topic in the DC media echo chamber is the notion that Metro might start closing at midnight on weekends as opposed to 3 a.m., a practice started in 1999 at the urging of the Board. The midnight closing idea was floated weakly by your assistant, Dave Kubicek, at a recent Board meeting. It has been a divisive issue to say the least, and since then, there's been an eerie silence from you. On one side, you have people claiming DC nightlife would be harmed, that it would put drunk drivers on area roads, that Metro would be irreparably damaged and that DC would lose its reputation as a "world class" city. Some even think more politicians should be more directly involved in Metro's operations than they already are! A Washington Post story found most late-night users were drunks. All of this leaves most people who know nothing about how to run a railroad, like Unsuck, confused. Is staying open late a safety concern? Is it something that can be dramatically better managed with increased efficiency and improved planning of track maintenance? Does Metro make money or lose money on late-night service? Is late-night service a budget issue? You've been around for a while now. 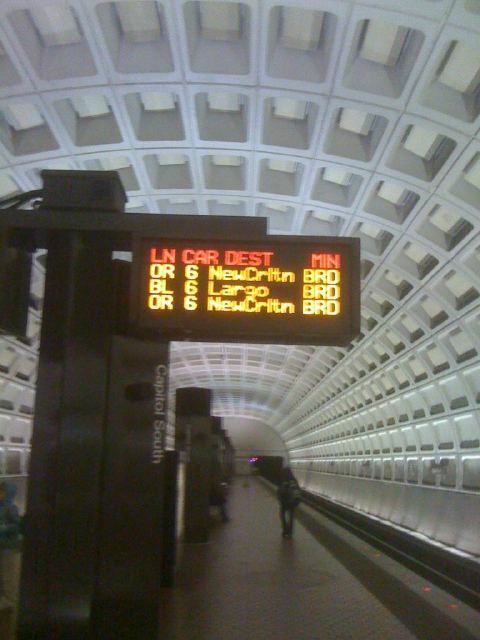 Metro has been running until the wee hours on the weekends for over a decade. Can that schedule be maintained or not? People want to know. Indecision only further damages Metro's reputation. Don't wait for the Board to lead. The politicians that make up the Board aren't inclined to reduce service to constituents without good reason. It's on you to make a tough call. The Board showed it can be swayed by your opinion, no matter what riders think--see bag searches. 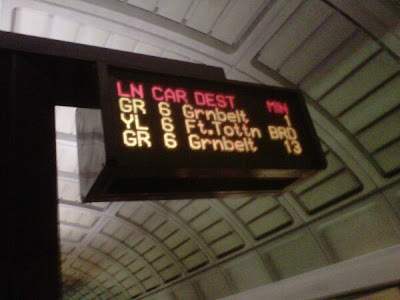 If Metro really needs the extra, late-night weekend hours to ensure better maintenance and safety, speak up. If not, allay fears some have that continuing late night service will reduce safety and increase commuting chaos. The debate over Metro’s warrantless, suspicionless bag searches – reviled by many as a retreat from constitutional protection against unreasonable searches, but called necessary in a new world of international terrorism by others – continues to roll along. Last week, a Metro board committee took up the issue, as other reports indicated a disappointingly tepid response to the controversy by the Metro board’s new chair. What do you think of Metro's plans to institute random bag checks? Count me firmly in the majority. As others have said more cogently, the searches – ostensibly aimed at detecting explosives – are an assault on civil liberties that set the stage for even more invidious things to come. Throughout our history, police and security forces have long trampled civil liberties, in large part because police come from a command-and-control mindset, where the first instinct is to crack down or use force. (A generalization, yes, but in my experience, typically true.) And, of course, with the fear-mongering induced by politicians today, questioning security has the same pariah status as appearing soft on communism during the Cold War. That said, I’d like to humbly suggest a solution that could satisfy both camps, and which I don’t think has been part of the public debate yet. The solution starts with the understanding that the purpose of these bag checks for explosives isn’t to find explosives. This is absurd, but true. Even the cops and bag search proponents admit it. 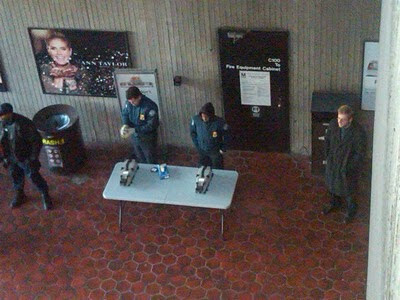 Metro police recently told the Metro Riders’ Advisory Council, for example, that they do not expect to actually find explosives during their searches. Likewise, when New York City went to court to successfully defend its bag search program – a case which WMATA relies upon heavily to justify its program – witnesses said it makes no difference that a would-be terrorist could decline a search and leave the system untouched, presumably with bomb in hand (or trench coat, as the case may be). What, then, are searches for explosives meant to accomplish, if not find explosives? So there it is – the key isn’t to look for bombs per se, but rather to generate the uncertainty and unpredictability that thwart the terrorists. Why couldn’t Metro use some other uncertainty-creating activity, rather than faux bomb searching, to introduce that uncertainty, and which also happens not to raise concerns about busting civil liberties? Instead of pulling passengers over and violating their rights against unreasonable searches by looking for explosives they don’t really expect to find, how about, say, beefing up platform patrols? Becoming highly visible in a way that’s not done now? Using additional dog patrols? Officers actually riding in subway cars enough that riders see them more than once or twice a year? (That really WOULD be unusual.) Descending into the bowels of Metro Center often enough to observe what really goes on there? And so on. And that leads to the real beauty of such a plan – in addition to creating that unpredictability, the stepped-up activity can at the same time address other pressing needs, too. Pretty much any rider will tell you that Metro police need to be more visible and effective, whether in dealing with the hooligans at Gallery Place/Chinatown, the rowdy kids that flood the system when school lets out, or the thieves who steal iPods and iPads. The point is: There’s plenty of high visibility, routine-disrupting activities Metro could undertake to satisfy the twin goals of 1) thwarting terrorists without stomping on civil liberties, while 2) also furthering workaday security and safety. Given the way cops think, I doubt they’ll ever suggest something like this themselves. And Metro’s new czar/chief executive, Richard Sarles, is probably too vested in supporting the current program to back away from it now. That leaves the Metro board. With recent changes in membership, there’s some hope for life in what has been a distressingly moribund group. But taking on the security apparatus will require guts. And unfortunately, few would accuse the board of having much fortitude in recent times. Here’s hoping a majority of the board will find spines and implement a truly reasonable solution. SHORT TAKE: As long as we’re talking about Metro bag searches, it’s important to clear up a misconception. Metro police and others have said the program is patterned after the New York City search program, the constitutionality of which a federal appeals court has upheld. That police exercise no discretion in selecting whom to search, but rather employ a formula. 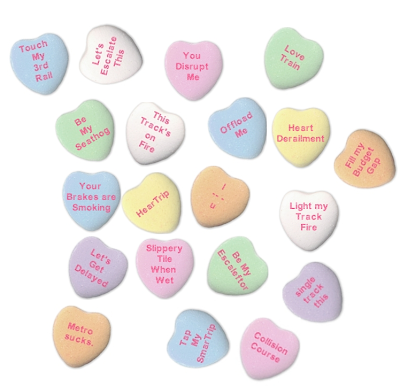 The Metro program, however, plainly does involve discretion. Even though it uses a formula – every sixth person, every 14th, etc. – passengers often arrive simultaneously at Metro’s wide station entrances and concourses (which are very much unlike the New York system). In such instances, Metro police told the Riders’ Advisory Council, when applying their formula, they will make a judgment about who “breaks the plane” of the station first. (There’s a bad football joke here somewhere.) Likewise, police said they won’t search purses, and will only search bags judged capable of holding explosives. But when does a purse become a bag? A backpack? For that matter, what is the minimum size of a bag for holding a bomb? Such things are left to officers’ discretion. That a typical search lasts only a matter of seconds. In the case relied upon by the appeals court, which involved road checkpoints, the time in which police had contact with motorists “lasted only a few seconds.” Yet with Metro, according to the agency’s own videos, the length of contact is considerably longer, running up to a minute. At first, the PIDs were a wondrous, novel luxury unknown to other American subway systems. 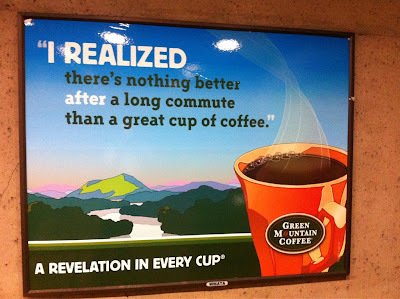 They were great unless the one you were staring at said the next train was 20 minutes away. But as Metro has declined, so too have the PIDs. The decline started last year. 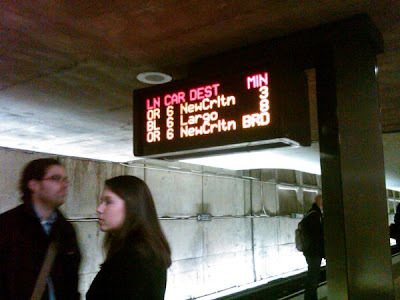 At first, they were just minutes off, needing recalibrating, Metro said. It's unclear if that ever happened. Things got worse, and it soon seemed the PIDs began to have no connection to time whatsoever, making them useless. But Metro wouldn't stop there. Now, the PIDs have no connection to space. What's next? Track 9 3/4? Here's a collection of pics from the past couple of days. 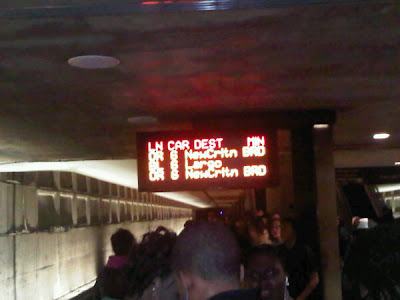 Create your own here, email the result to unsuckdcmetro[at]yahoo[dot]com, and we'll post.